Most countries in the world have little capacity to deal effectively with invasive species, a study suggests. Writing in Nature Communications journal, and international team forecast how the spread of species could change over the 21st Century. They show that one-sixth of the world's land surface is vulnerable to invasion. In what the authors say is the first evaluation of its kind, the paper assesses individual nations' abilities to manage existing invasive species and respond to new ones. Regan Early from the University of Exeter, Jeffrey Dukes from Purdue University in the US and other co-authors suggest that developed countries, which have been most affected by invasive species - and have the strongest management efforts - will continue to face an onslaught of new arrivals. However, they predict that non-native plants, animals and microbes will increasingly threaten developing countries with some of the last remaining biodiversity hotspots, due to increased air travel and the expansion of agriculture. This could endanger livelihoods and food security in fragile economies that are ill-prepared to deal with the expansion of invasive organisms. Dr Early commented: "Rampant globalisation will lead to invasions in countries with the least capability to deal with them. "We need more international cooperation, and the US, Australia and nations in Europe to share expertise." Prof Dukes added: "Low-income countries stand to lose a lot by having their natural resources sapped by invasive species. "We hope this analysis can be a conversation starter for governments around the world to strengthen their protection." Invasive species often travel as stowaways or contaminants in goods imported by planes and ships. They also arrive as exotic pets or plants that subsequently escape or are released deliberately into the wild. This can pose challenges native species that have evolved over thousands of years to be well adapted to their ecosystems. Consequently, new arrivals can quickly change the nature of a whole region and often outcompete native organisms for resources and habitat. 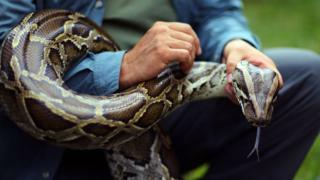 Burmese pythons originally arrived in the US as exotic pets, but they escaped and quickly established themselves in the Florida Everglades, where they have contributed to a catastrophic decline in native mammals. In Europe, forests and woods have been transformed by introduced diseases and pests such as Dutch elm disease and Ash dieback. "You can think of invasive species as biological pollution - a self-replicating change," said Prof Dukes. "It doesn't take much effort or intention to bring in an invasive species that then wreaks havoc on a landscape." Biological invasions in the developing world so far have included influxes of Diamondback moths, which can devastate broccoli, cabbage and other crops; Panama disease, which wiped out banana plantations in central and south America; and prickly pear, which devastated grassland in Africa, leading to cattle being malnourished.